A recipe for a chocolate fudge cake. 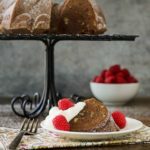 It is a dense, moist, and fudgy chocolate cake baked in a bundt or tube cake pan. It is a great dessert for any occasion. Do not preheat the oven. Grease and flour an 8- or 10-cup bundt pan or tube pan. In a large bowl, cream butter until light and fluffy. Add sugar, cocoa, egg yolks, and vanilla and beat until combined. Add the flour mixture in three additions, alternatively with the egg whites in two additions, mixing on low speed until just combined. Do not over mix. Batter will be thick. Bake at 250 degrees Fahrenheit for 1 hour and 45 minutes, or until a toothpick or cake tester inserted in the center comes out clean. Cool cake in the pan for 15 minutes. Remove cake from pan and cool completely on a wire rack.